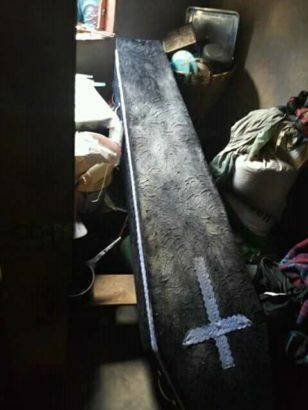 People of Kaoma district in neighbouring Zambia were shocked on Tuesday as a coffin was reported to have refused to be buried in a tradition practice known as Kikondo. According to Online reports, the deceased was a 47-year-old female who until her death was unmarried. Reports say the drama started when the body arrived at a local New Apostolic Church for service in the morning of Tuesday 27th March. The coffin is said to have refused to enter the church building upon being removed from the canter and instead led its bearers to a house and plunged it through the window breaking glass panes and lodged inside the house. The action attracted a huge mob that wanted to witness the shocking incident such that police were called to the scene and used teargas to disperse the irate mob. 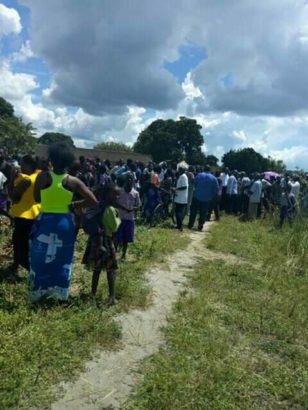 Kaoma District Commissioner, Kennedy Liale Mubanga said it took the reinforcement of soldiers who were led by the Battalion Commander from the army barracks who went to retrieve the coffin and a forced burial was ordered by the DC in the afternoon. This is not the first time for shocking news like this to have happened in Zambia. In a similar occurrence that happened in May 2017 in a Zambian village, a corpse refused to be buried until it led villagers to the house of its killer. The video of the incident was shared online by an official with the Zambia Ministry of Foreign Affairs, Hagra Tembo. In the video, the villagers were all shocked when undertakers were being controlled by the corpse who turned them round until it led them to its killer’s house.